Joseph's Grainery: Now Available in Stores! Tell your grocer to get it now! Ask for it by name. Joseph's Grainery, from our farm to your table. Our whole grain products made their debut at the Rosauers Supermarket in Colfax, Washington today! 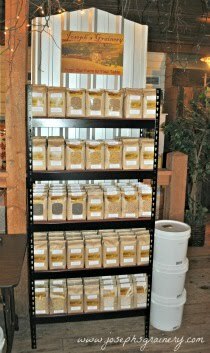 Would you like to see Joseph's Grainery products on the selves of a store near you? Ask the manager to carry Joseph's Grainery Whole Grains and Flours. You can also contact us here and give us the store's name, manager and contact information and we'll get in touch with them as well.